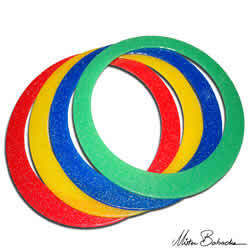 You should have mastered 3 Ring Juggling before attempting to juggle with 4 rings. This will get you used to the main aspects of how to hold, throw and catch the rings. 4 Rings are juggled using a pattern called The Fountain. You learn by juggling with 2 rings in just your dominant hand, then you can practice using your weaker hand. When you combine both hands each juggling 2 rings, you have the 4 ring fountain! 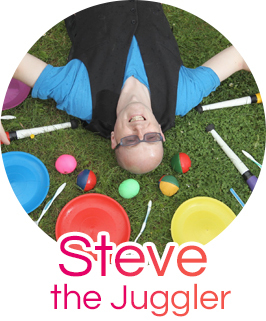 The same “fountain” rule applies for any even number of objects you care to juggle (eg 6 clubs is 3 club juggling in each hand, 8 balls is 4 ball in each hand etc). See my Numbers Juggling article for more details. Please learn these before you try doing a 4 ring juggling fountain – I promise it will help! 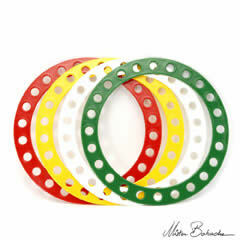 Throw the 2 rings in an Anti-Clockwise direction, then practice throwing them in a Clockwise direction. Now try it with your weaker hand. Throw one ring up, then move your hand over a little and throw the next one up. Return to the first ring, catch and throw it again, then to the second ring (and repeat!) Each ring goes up and down in its own straight line (just like a lift/elevator)! Synchronous Throws Throw a ring from each hand at the same time using an inward scoop to let the rings circle outwards. As the rings peak, throw the next two up, then keep going! Staggered /a-sync Throws More difficult than synchronous throws, as you have much more to concentrate on. You are still juggling two rings in each hand, but throwing from each hand at a different time. You only need 12 catches to call yourself a 4 ring juggler (3 repetitions of 4 rings), so keep persevering and you will soon be well on your way to achieving this! 4 Ring Half Shower Start with 2 rings in each hand. Now throw one high from your dominant hand and one slightly lower with your weaker hand at the same time. They should not collide due to the difference in heights thrown. Practice this a few times, and then every time both rings peak, it is time to throw the next 2 rings (one high and one low as before) at the same time. See if you can manage to change direction during the trick (not too difficult once you have mastered one direction)! Colour Change Buy rings which have a different colour on each side, or stick two different coloured rings together. Practice using just one ring, and build up to being able to doing constant colour changes with every catch! Instead of your usual catch, this time you have to catch the top of your ring by putting your hand through it. This lets you turn the ring to face the other way before you throw it again. Double Ring Grind Practice one ring grind first before moving on to the double. A single ring grind is where one ring is held horizontally and another ring is thrown with lots of backspin and caught on top of the horizontal ring. It should spin vertically for a few seconds before losing power. The double ring grind is where you hold two rings in each hand (separate them just slightly to allow them to part easily in mid-air). One hand contains the 2 rings that are going to be thrown high with lots of backspin to do the grinding. Once they are thrown, you pass a ring from the other hand so that you now have a flat ring in each hand to catch the falling rings on to grind. You can then either let the rings grind till they stop and fall into your hand, or do a quick throw back up and continue 4 ring juggling! Butterfly Catch Learn this with two rings in one hand before moving on to trying with 2 rings in both hands. Here’s the description for a single butterfly catch! Catch a ring and turn it round, so that it is touching your arm (it should be hooked over your thumb). When you next catch in the hand, you will now have two rings in one hand that are overlapping each other. When you throw both of these rings at the same time, one goes high and one stays low and you can repeat the butterfly catch or quickly change to another trick! Stack Rings on Neck A good way to finish your ring routine is to place each ring around your neck as you catch them. If you can put all 4 rings around your neck, try immediately taking them off one by one without breaking your rhythm and continuing to juggle! When taking a ring off your neck, let it brush the back of your head. This should stop the ring from hitting your nose and ears on the way back up! Transition from 3 rings to 4 At any point during your 4 ring juggling, you can place a ring over your head, under your arm, between your legs or in your mouth so that you can do some 3 ring juggling instead before returning to 4! Returning Ring Throw one ring along the ground with lots of backspin so that it returns. You can then perform a quick 3 ring juggle before the 4th ring returns! Alternatively you could throw 2 rings along the ground and as they return, throw the other 2 along the ground (and repeat!) This is almost the horizontal equivalent of the columns trick! Pancake Flips: Flip the rings like you would toss a pancake. Rings Facing Audience: If you are facing the audience, you could turn the rings so that they are flat in front of you and continue juggling. Once again, it may be best to go back to learning the cascade with these throws first before attempting any other tricks.